Andrew Nixon, Project Manager of the Apollo Bay Trails Feasibility Study has completed the draft document of some 300 pages. This is presently with Parks Victoria for comment. It is also to be presented to the Colac Otway Shire at their next meeting on January 25th at 6pm at COPACC. If accepted, the document will be open for public comment for 6 weeks. The day was cool, overcast and windy but the forecast showers did not eventuate. 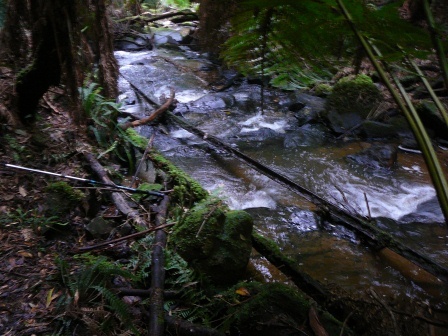 14 walkers were led by Alan Dow from Lavers Hill down Morris Track and past the old swimming pool to North Chapple Creek. 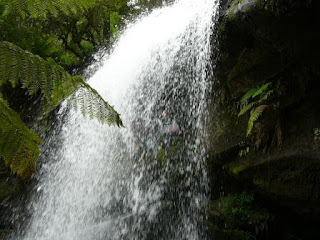 They then followed a walking track through large tree ferns to Glasgow Falls. There was a strong flow of water over the falls owing to recent rain. Some walkers crossed the headwaters and proceeded to the foot of the falls for lunch while others remained at the top of the falls with dry feet. After lunch, the walkers returned to Morris Track and thence to Mt. McKenzie Track where Alan had left his car. After some car shuffling, all walkers were conveyed back to Laver's Hill. The walkers then motored down Chapple Vale Rd and walked via an old tramway to an old quarry site and South Chapple Falls. These falls are attractive with a good flow of water though they seem to have been modified by quarrying. The intrepid walkers then progressed to Melba Gully and walked the loop. Much birdlife could be seen and heard. The party then returned to Otway Nourished at Ferguson for refreshments and were favourably impressed by this new cafe. 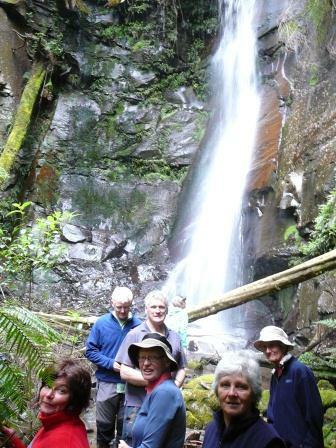 It was pleasing to welcome new walkers Richard, Sally and Gus from Apollo Bay and Caroline from Ferguson.